Little Miracles Designs is a landscape design / build company providing a full service to clientele in Brooklyn, Manhattan and now in Downtown Toronto. We create functional and easy to use urban gardens that reflect today's lifestyles. Our philosophy is simple—we help your garden dreams become a reality. We are recognized across the industry for our landscape design expertise. 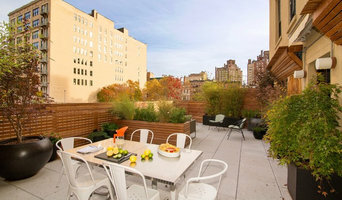 We offer design and installation of roof gardens, terraces, backyards, patios, and decks, primarily in Manhattan, Brooklyn, and Astoria/Long Island City. We can also design projects remotely anywhere around the globe. Check out our website, www.amberfreda.com, for more photos and information about our company. CLC was founded on the idea that "great landscapes begin with great design ideas." As one of the first landscape architect design/build firms in the state of New Jersey, we have the ability to generate great landscape design ideas and follow them through the design process to installation continuing with positive long-term client relationships. New Eco Landscapes is a sustainably-minded landscape design and construction company based in New York City. We offer a variety of services like landscape design, landscape construction, gardening, green roof design and construction, drip irrigation systems, patios and decks, fencing and pergolas, waterfeatures and plants for sale or rent. Give us a call today at 646-770-3602 to setup your complimentary design consultation! 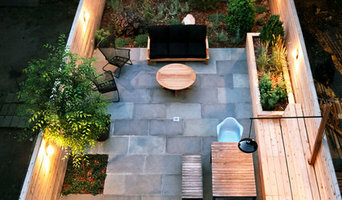 We are a Brooklyn based, full-service, landscape design and construction company specializing in a variety of urban garden design for rooftops, backyards, front yards, terraces for residential and commercial clients in the New York City area. We've been design, installing and maintaining gardens for over 20 years on both sides of the Atlantic. For the last 10, we’ve been in New York! We have seen many garden spaces and solved many garden design problems and came up with many garden installation solutions. (Not to mention resolving issues with drainage, sudden plant death, escapee weeds, fallen trees, and all other damages by mother nature) and we still get very excited by new garden spaces and their potential transformations. The garden is not just a selection of plants, but a living illustration always changing in color, texture and effect. It offers a natural sanctuary from the world and a constant reason to throw a party or to have breakfast outside. We design it with timing in mind so that blooming flowers and budding leaves are synchronized with each other throughout the seasons and years. For those interested in the monetary value of their home, it increases it. For those who would love more room to live, escape and entertain, the garden makes you wonder what you ever did without it—no matter how big or small. And for kids and dogs, a garden is laughter and wagging tails. We design high-style, low maintenance gardens, so your garden can look it's best in all seasons without a full time gardener. Our designs grow through talking to each client, finding out what you have in your imagination, and how your property is used. When designing landscapes, we take into account the style and time period of the building and the neighborhood. We also offer coordination of planting, water features, carpentry and masonry from trusted contractors for our landscape designs. At Cording Landscape Design, Inc. our approach reflects our respect for the beauty of the natural environment. Beginning with the first meeting, we cultivate lasting relationships with our clients, ultimately culminating in a partnership that endures. We practice a “hands-on” approach ensuring that our designs blend our creative visions with practical common sense knowledge gained through “on the job” experience. The results are a design that enhances your lifestyle within your desired budget. Conte & Conte, LLC, a landscape architecture firm, is dedicated to enhancing the relationship between people and their natural environment. Our registered landscape architects are trained professionals. Applying both art and science to landscape design, Conte & Conte, LLC specializes in the planning and design of residential, and educational properties with the end goal of maximizing clients functional and aesthetic requirements. We strive to provide highly personal service and unique design solutions intended to provide truly spectacular outdoor living environments. After spending 20 years working together in the landscape construction industry, John & Kim Conte founded Conte & Conte, LLC in 1997. Combining their talents and their successes in the field of landscape construction, they have built a design firm that is a powerful combination of creative design solutions and highly effective project implementation. This extraordinary combination of design/build skills is what sets Conte & Conte, LLC apart. Not just a drawing and a hand-off, but a full service, “get-the-job-done” mindset taking the client through the entire process of project Planning, Program Development, Site Design, and Project Construction. We work closely with Fairfield House & Garden Co, our sister company to facilitate landscape contracting--www.fairfieldhouseandgarden.com. However, we are happy to work with a professional of your choice as well. Founded in 1979, Z.O. Landscaping & Supply Inc. has over 35 years of professional experience in the landscape construction industry. We offer quality landscape design, hardscape installation and a full line of landscape supplies. Attention to detail and customer service is the foundation of our business. Our uniformed crews are professional and courteous; they drive clearly marked vehicles and work under strict guidelines to ensure minimal inconvenience to our clients. What's more, our employees often attend ongoing education programs. We offer a one-growing-season guarantee on all installed plants. Our goal is to enhance your landscape to add beauty and value to your home and community for many years to come. Z.O. Landscaping & Supply Inc. is a fully insured company. Horizon Landscape Company, located in Wyckoff, NJ is one of Bergen County’s leading landscape companies. Horizon Landscape has been serving Bergen County and the surrounding areas for over 40 years delivering unparalleled quality in landscape design & construction, landscape lighting, irrigation systems, and drainage solutions. Whether you are considering a new pool, outdoor kitchen, patio or planting, Horizon’s design team will help you achieve the vision for your property. Through our management team’s 140+ years of combined experience to our trained craftsmen in the field, you are ensured a lifetime of picture-perfect outdoor living. Excellence in horticulture, professionalism, attention to detail and a commitment to customer care are the foundations for our long-time success. At Horizon we will take your landscape from concept to completion and beyond. Harmony Design Group, a New Jersey Licensed Landscape Architecture firm, is committed to providing innovative custom landscape designs that indulge your senses and transform an ordinary yard into a breathtaking landscape oasis. We cultivate lasting relationships with our clients to create better lives and living environments, with emphasis on custom, quality design and workmanship. Our ongoing commitment to customer satisfaction and meticulous planning assures a finished product that will provide a life time of enjoyment. 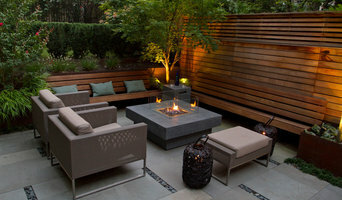 GREENCITYdesign is Landscape Design & Build company based in Hoboken, NJ. 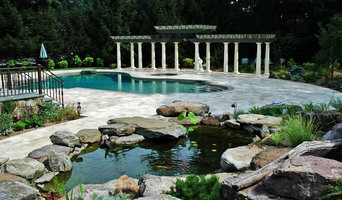 We specialize in Urban Landscape Solutions throughout the NYC Metro Area. Working within the constraints of the ever changing urban environment, GREENCITYdesign's goal is to create a modern twist on the landscape, while accentuating the beautiful and unique appeal of New York City’s architecture and infrastructure. Our design team works alongside our staff of craftsmen and horticulturists, helping bring to life the visions and desires of the client; providing the highest quality design, craftsmanship, and attention to detail throughout the process, all while working within the clients budget. Through the use of local plants and materials, we create multi-functional and sustainable indoor and/or outdoor habitats for our clients, as well as the surrounding community. Landscape Design + Build -Exteriors & Interiors First, we are evangelical about beauty. We believe beauty informs function, not the other way around. And beauty is more than just something to look at. It dictates success, and behavior. Ever notice how people behave better in a beautiful setting? We study how it works too. We think YOU know a little ...because you've taught us what compels people to enter a space. We continue to learn and ask questions...ie - How does it beckon us this way or that? Second, our clients are our life blood. I often complain I have too many keys but the truth is those keys represent TRUST. We build long term relationships with the majority of our clients. Our work only actually works when you are 100% pleased with the result. We started as a small company offering Landscape Services 35 years ago. Over the years, we have slowly added other Hardscaping Services and in 2002, we added Custom Outdoor Kitchens to complete our company’s services and offer a one-stop shop to our clients. We offer free in-home consultation; during this first meeting we discuss your ideas, plans and budget for your project. Based on our evaluation of the project site, we will be able to offer you different design ideas to accomplish your dream outdoor living space. We have a unique ability to accommodate our clients by helping them to complete the project in different phases if need be. Make sure to consider important qualities and qualifications when selecting the right installer. Outdoor Living of NJ can meet these requirements, so your project will run smooth and meet all your exceptions. We are licensed with a Home Improvement Certificate and fully insured. Outdoor Living of NJ not only wants to build your dream outdoor living space, but we would be also honored to have the opportunity to create a place where you will spend many years, while growing your families and creating unforgettable memories. Contact us to get started on your project! Das Tätigkeitsspektrum von Landschaftsarchitekten umfasst die Landschaftsplanung und Beratung bei der Gestaltung und dem Bau privater Gärten und Grünflächen mit Landschaftsarchitektur. Sie designen Gärten, Reihenhausgärten, gestalten den Außenbereich oder die Zufahrt zu Grundstück und Garage. Landschaftsarchitekt darf sich in Deutschland nennen, wer in die Liste einer Architektenkammer eingetragen ist. Voraussetzung für den Eintrag ist ein abgeschlossenes Studium der Garten- und Landschaftsarchitektur sowie mehrjährige Berufspraxis. Die Bandbreite der Landschaftsarchitektur sowie der Landschaftsplanung und Freiraumplanung umfasst für private Bauherren die Planung von Terrassen, das Design von Garten, Vorgarten oder die Innenhofgestaltung. Hinzu kommt die Landschaftsplanung für größere Projekte wie die Gartenarchitektur öffentlicher Parks, Grünanlagen oder Schlossgärten. Neben der Gartenberatung erstellen Landschaftsarchitekten Gartenpläne und führen Studien über Umweltverträglichkeit durch. Wenn Sie Ihren Freiraum und oder Ihren Garten professionell planen lassen möchten, erstellt der Landschaftsarchitekt in Passaic, NJ ein Konzept für die Gestaltung der Gartenanlage und berechnet die Kosten. Für die Umsetzung arbeitet der Gartenarchitekt mit Fachfirmen zusammen, darunter Garten- und Landschaftsbaubetriebe, Bauunternehmen und Landschaftsgärtner. Lohnt es sich, einen Landschaftsarchitekt in Passaic, NJ zu engagieren? Der Vorteil, wenn Sie ein Landschaftsarchitekten beauftragen, ist, dass Sie Außenbereich und Garten individuell gestalten können – nach Ihren Vorgaben und Ihrem Geschmack. Auch das Anlegen von einem Brunnen oder einem Teich, neue Pflanzungen, die Planung der Beleuchtung sowie Be- und Entwässerung des Gartens, ist Teil der Landschaftsarchitektur. Eine professionelle Gartengestaltung lohnt sich nicht nur bei bei einem Neubau. Wenn Sie ein altes Haus kaufen, kann ein Landschaftsarchitekt den verwilderten oder verwucherten Garten oder auch den vorhandenen Freiraum umgestalten und Ideen für die Bepflanzung liefern. Befindet sich das Grundstück in Hanglage oder in einer schiefen Ebene, müssen Treppen und Stützmauern gebaut werden. In solchen Fällen ersparen Sie sich Zeit und Geld, indem Sie ein Architekturbüro für Gartenplanung in Passaic, NJ engagieren. Wie finde ich den richtigen Gartenarchitekten in Passaic, NJ? Kennen Sie jemanden in Ihrem Umfeld, der seinen Garten oder seine Landschaftsarchitektur von einem Landschaftsarchitekten gestaltet hat? Private Kontakte sind häufig der Ausgangspunkt bei der Suche. Sehen Sie sich Referenzen von Projekten an, um den Stil des Architekten kennenzulernen. Wenn Sie online nach einem guten Gartenarchitekten in Passaic, NJ suchen, finden Sie auf Houzz Projekte verschiedener Anbieter in Ihrer Nähe. Besuchen Sie das Profil des Gartenplaners und sehen Sie sich die Bilder an. Sind die Projekte aktuell? Entspricht das Gartendesign Ihren Vorstellungen? In den Portfolios finden Sie zu jedem Landschaftsarchitekt Infos wie Dienstleistungen, Einsatzorte oder Auszeichnungen. Die Erfahrungen anderer Kunden helfen, die Arbeit des Landschaftsarchitekten einzuschätzen. Was kostet ein Landschaftsarchitekt in Passaic, NJ? Viele Menschen meinen, Landschaftsarchitekturbüros würden ausschließlich große, öffentliche Projekte gestalten. Hieraus entsteht der Eindruck, einen Architekt für den Garten sei purer Luxus. Tatsächlich planen und entwerfen Gartenarchitekten auch die Gestaltung kleiner Gärten. Als groben Richtwert für die Kosten der Gartenplanung und Gestaltung können Sie mit etwa 12 bis 18 Prozent der Bausumme rechnen. Die Höhe bemisst sich nach verwendeten Baumaterialien, der Menge und Auswahl der Pflanzen, dem Einsatz von Baugerät und Maschinen oder Sonderwünschen. Wer sparen will, kann einfache Gartenarbeiten selbst ausführen und durch Eigenleistung die Kosten für die Gartengestaltung senken. Wie Innenarchitekten und Architekten, sind Landschaftsarchitekten bei der Abrechnung an die Honorarordnung für Architekten und Ingenieure (HOAI) gebunden. Diese enthält neun Leistungsphasen sowie Mindest- und Höchstsätze für die jeweilige Planungsleistung. Auf Grundlage der HOAI lassen sich die Kosten für den Gartenarchitekten in Passaic, NJ detailliert nachvollziehen. Sind Sie Mitglied in einer Architektenkammer? Zeigen Sie Beispiele für Ihre Gartenarchitektur und Landschaftsarchitektur online? Bieten Sie eine kostenlose Erstberatung an? Wieviel Zeit vergeht von der Planung bis zur Ausführung? Ist es möglich, Eigenleistungen zu erbringen? Auf Houzz finden Sie ein Verzeichnis mit Adressen und Projekten von Architekturbüros für Garten- und Landschaftsgestaltung in Passaic, NJ. Gehen Sie die Liste durch und speichern Sie die schönsten Ideen für Ihren Garten in einem Ideenbuch. Verkleinern Sie den Radius Ihrer Suche, um Anbieter in einer bestimmten Stadt oder der Nähe Ihres Wohnorts zu finden. Lesen Sie die Kundenbewertungen und kontaktieren Sie Ihren Wunsch-Landschaftsarchitekten, um weitere Infos zu erhalten.